I was so excited when I heard about these that I want to 15 different stores looking for them. I finally found them, brought them home, swatched them and forgot about them! I don't know the name of the collection. All these colors are extremely pretty and definitely worth getting. Flair. OMG Amazing purple! It's stunning- can you see the tiny blue and red sparkles? They're there, I promise! Flash. Bright, luminous blue with little sparkles that flash in the sunlight. Glow. Fantastic bright green with golden glow. One of the best light greens available, in my opinion. Spark. A deep, bold navy with hints of purple and lots of shimmer when the sun hits it. Vivid. Strange name for this color, don't you think? I love this color- it's a rich mahogany, or maybe it's cherry? It reminds me of some kind of wood. Red-tinged brown with red and hints of black. Looks amazing in the bottle AND on the nails! I got mine at CVS, but now that they have been out for a while I've seen them in every major drugstore and grocery store. One caveat- it was pointed out to me that the bottles hold a deceptively tiny amount of polish- only 0.3 fluid ounces! For comparison, an OPI is .5 fluid ounces. The size and shape of the bottle makes it look like it holds a lot more. I *just* bought Spark yesterday it's beautiful. Now I feel like I need flair too. Wow those look amazing! What store did you end up finding them in? Woho, I painted my nails with glow last night:) that's cool! I love it! Glow makes me drool. Big time! Gorgeous colours. I wish we had decent drugstores in the UK. I spent £60 in Superdrug this week and I didn't even get anything fun! Tiffany, I finally found them in a CVS. I had looked there twice, but one day they had them! Kittylamour, that's no fun! But you guys have Boots, right? I hear Boots is pretty awesome. I'm jealous of Canadians and their Shopper's Drug Mart! I've been to one a few times and OMG! Chanel and toothpaste, I couldn't believe it! line of brights and deeps with a jelly finish. A limited edition was released last summer (that's where I got my summer brights) and this year they released some more edgy colors. Not bad for a drugstore brand.. While I am generally not a fan of SH, these colors kinda renewed an interest in this line for me. My mom likes the formula, so eventually I'll pick up Vivid for her. 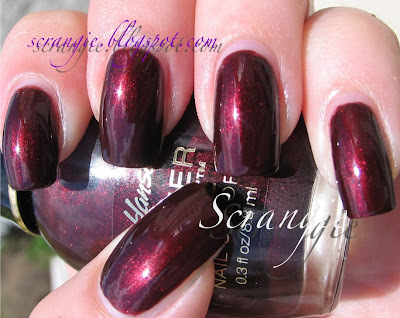 I swear Vivid is a dupe for OPI Wine Me, Dine Me from OPI's '07 Holiday collection. At least it looked like it when I had picked up the bottle in the store while I was wearing OPI WMDM as my mani! Gorgeous color! Kittylamour, definitely, I don't know what I'd do without my 8ty8, H2T or TD!! Anonymous, it really, really is!! Amazing colors! I'd love to have everyone of them! Is Spark at all similar to Yoga-ta Get This Blue or MAC's Naughty Nautical? I have a tendency to buy the exact same blue over and over again. Anonymous, I'd say Spark is somewhat similar to those, but not close enough to be a twin. Yoga-ta Get This Blue and Naughty Nautical are both bright, clean blues while Spark is kind of a 'dirty' purple-blue. Well, it looks like I'll be adding yet another dark blue to my collection! Thanks!